The original, now abandoned design for Melbourne's flagship Apple Store. 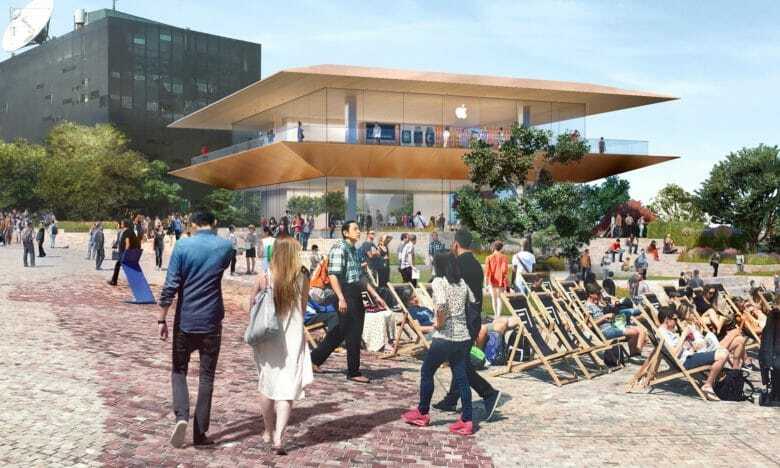 A fresh attempt is being made to demolish Federation Square’s Yarra Building in Melbourne, Australia to free up space for a proposed flagship Apple Store. The application has been made by the square’s management, which argues that the building to be demolished is not in keeping with the other building designs in the precinct. However, critics of the proposal suggest that it is being rushed through so as to avoid scrutiny. Specifically, the application would seek to destroy the existing Yarra Building before a consideration for heritage registration is resolved. Those in favor of the new Apple Store note that it would create more than 500 square meters of new public space, along with bringing in new visitors and money. Those against it point out that Federation Square is a space intended for public events. These include cultural performances and public protests. Already, construction on the proposed Apple flagship store has been pushed back to 2020 — with the eventual opening taking place in 2021. A previous attempt to block construction of the store failed in Australian parliament. Are you an Apple fan in Melbourne? What do you think should happen with this new proposed store? Let us know your thoughts in the comments below.